Explore the 2018 Ford Focus RS at Rhinebeck Ford Inc. | Rhinebeck Ford Inc. Explore the 2018 Ford Focus RS at Rhinebeck Ford Inc. The limited-edition Focus RS was designed for discerning drivers who want a world-class sports car without a hefty price tag. This compact hatchback is unlike any other vehicle out on the road, and it is going to turn heads every time you get behind the wheel. Ford’s engineers spent countless hours perfecting the RS’s aerodynamic body. From the grille to the spoiler, this hatchback maximizes downforce and minimizes lift. The AWD system automatically adjusts to your driving conditions, or you can manually change into different drive settings depending on your preferences. 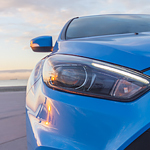 As soon as you hit the streets of Rhinebeck, NY in your new Focus RS, you are going to realize that this hatchback stands head and shoulders above the competition. Please stop by our dealership today to test drive the brand new Ford Focus RS.